Many students and freshers from college take up internships with various firms to gain experience. However, this is really not as easy as it sounds. The person needs to send an impressive cover letter with his or her certificates to the concerned organization. Writing such a cover letter take a lot of finesse. So, if you are not sure how to write such a letter, get some ideas from Sample Letters for an internship. 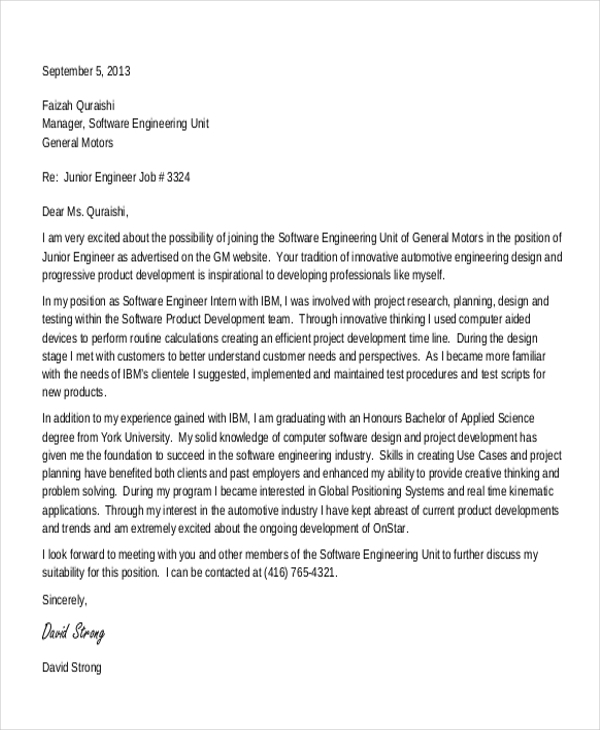 When a student wishes to apply for an engineering internship with an organization, he can use this sample letter to draft a unique and impressive letter for himself. The sample gives him an idea of the way the content should be written. 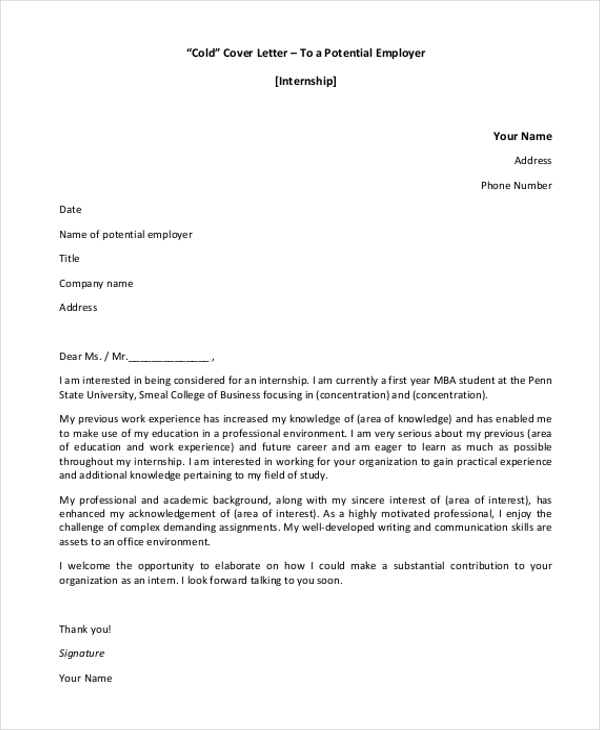 If you had a work experience but still wishes to work as an intern, they can use this sample cover letter to understand the right way to frame the sentences and write an effective letter. You can also see Job Offer Acceptance Letters. As the name indicates, this cover letter can be used by a student to apply for an internship with a firm. The sample letter gives him an idea of the format to follow and the segments to include in the letter. 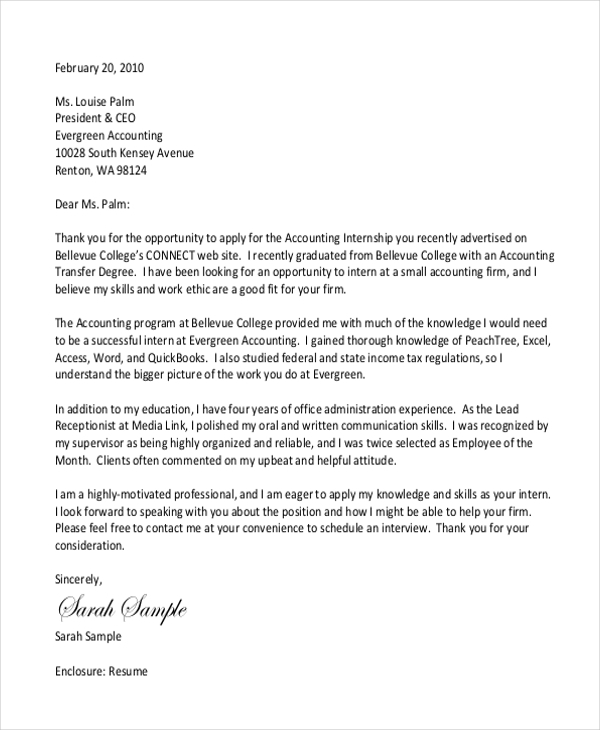 A person looking for a finance internship can use this sample cover letter to draft an impressive one to be sent to the financial organization. This sample gives him an idea of the right way to broach the subject. You can also see Administrative Assistant Cover Letters. When a person wishes to apply for a summer internship in the field of computer science, he can make use of this sample cover letter for the purpose. He can personalize this letter as per his requirements. When a college student wishes to apply for an internship with a firm, he needs to send a cover letter with his credentials. The aforesaid sample can give him an idea to draft such a letter. 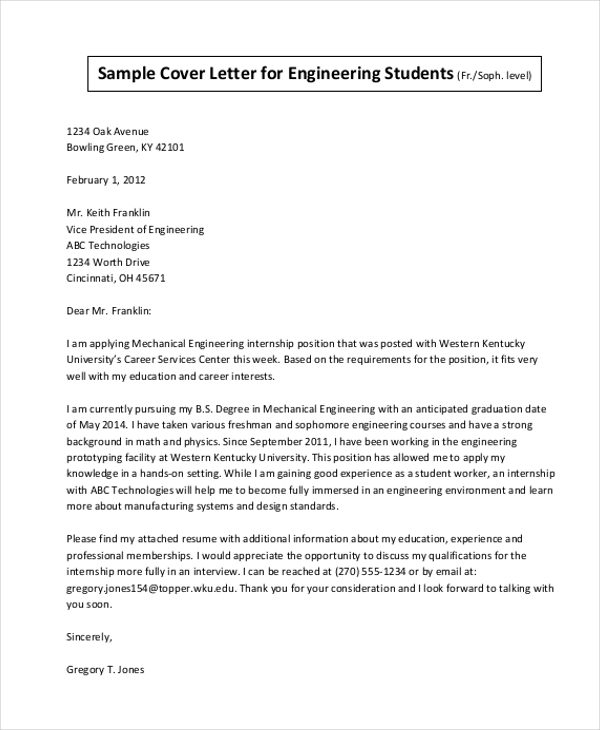 You may also see Example Cover Letter Samples. 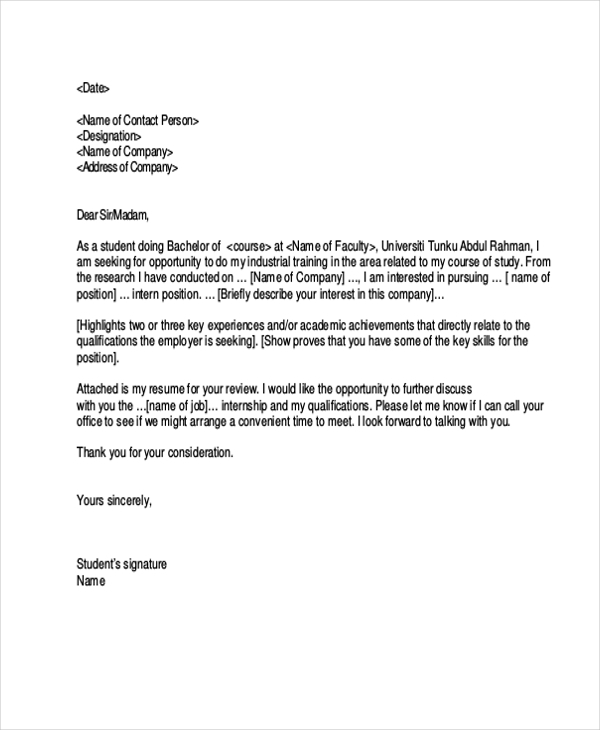 As the name indicates, this sample letter can be used by an organization or company to inform a student that his request for an internship has been accepted by them. Using this letter helps them to write an impressive letter. 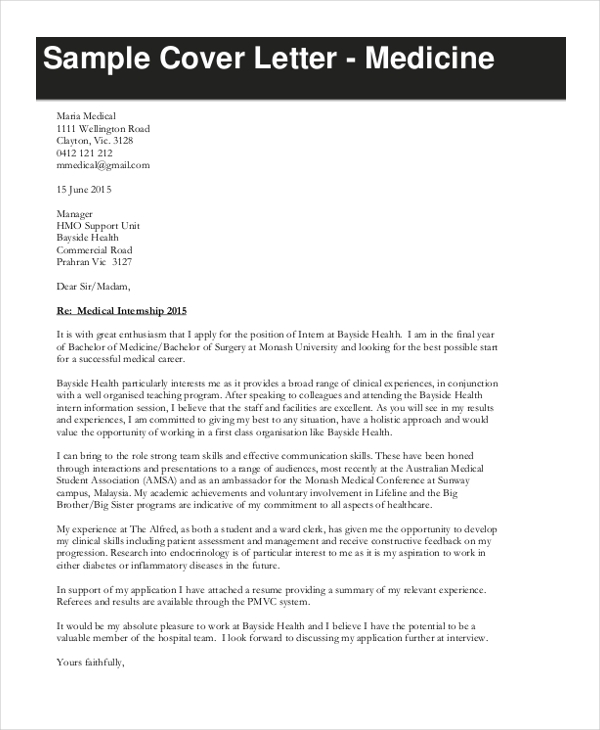 When MBBS interns wish to apply for an internship with a hospital, they can use this sample letter to get an idea of the right way to draft an effective cover letter. 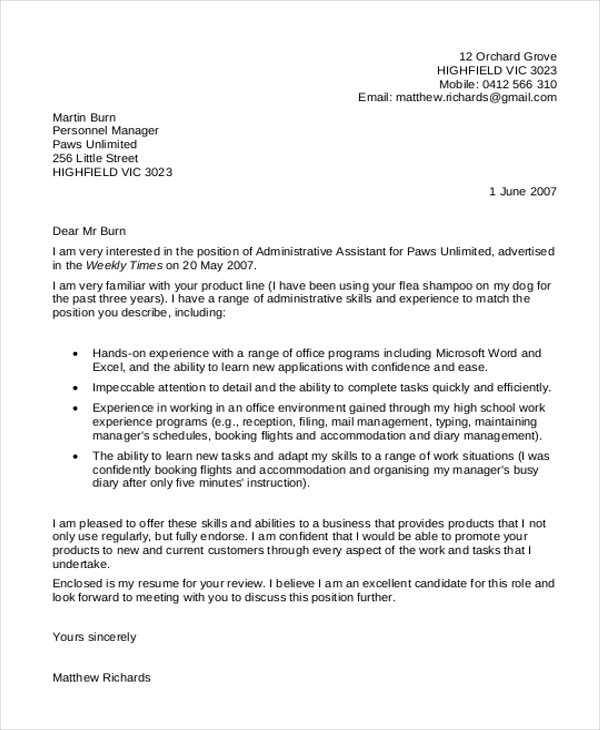 You may also see Cover Letter Examples. What are The Benefits of Using Sample Cover Letter for Internship? These have been designed by experts and thus have a serious and professional touch to them. Thus, you do not need to hire an expert to draft an impressive cover letter. 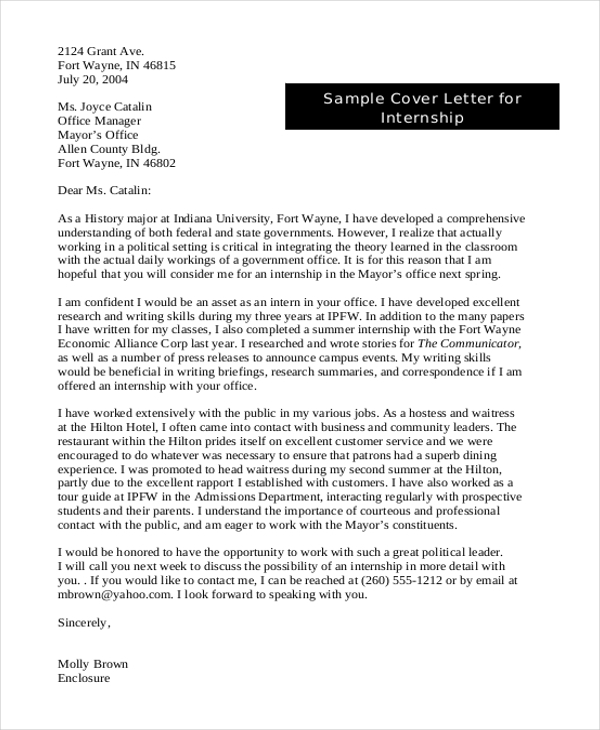 Need some help to draft a cover letter for an internship? Check out our collection of sample cover letter for internship and Job Application Cover Letters to find one that is perfect for you. The best thing about using these samples is that these can be easily customized as per your requirements. Use these to come up with a unique and impressive cover letter for an internship in a jiffy.